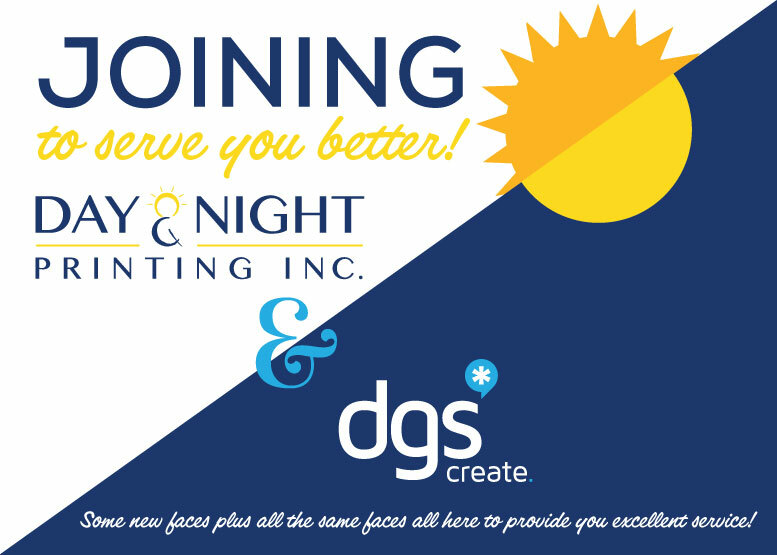 April 1, 2019 – Tysons, VA – Day & Night Printing, Inc. has entered into an agreement to acquire DGS Create, a well-known award winning digital printing, signage, and graphic design company based in Falls Church, VA.
An industry-leading, business of 18+ years, DGS felt that the time was right to transition and reached out to Day & Night to become part of a larger organization. Day & Night was looking to enhance its design and signage capabilities, as well as increase its web to print offerings. The acquisition will provide each client-base with a wider range of services and capabilities, while streamlining production and increasing efficiency from estimating & planning all the way to product installation or final delivery. Employees for both companies will be located in Day & Night’s current facility, located at 8618 Westwood Center Drive, Tysons, VA 22182. Both Day & Night and DGS will operate under the Day & Night Printing brand. Combining Day & Night and DGS under one roof and one organization provides current and prospective clients with a one-stop, comprehensive solution for a complete range of printed products & related services.